The National Electrical Code (NEC) does not permit having two wires connected to any individual breaker (with one exception). Without getting into a discussion on the rational for the rule, there are methods to correct the problem without adding sub-panels that are within code. Having two wires or circuits, as shown in Figure 2, on a single breaker generally occurs because the home has required additional receptacles or lighting. The most convenient method of correcting the problem is to add an additional breaker to the distribution panel. However, if there are no additional spare spaces available, installing a larger distribution or a sub panel can be expensive. If the breaker and the wire gauge do not match then you must replace the breaker with one that is of the proper rating. To better understand the situation, you can have any individual circuit power numerous items (there are some exceptions). 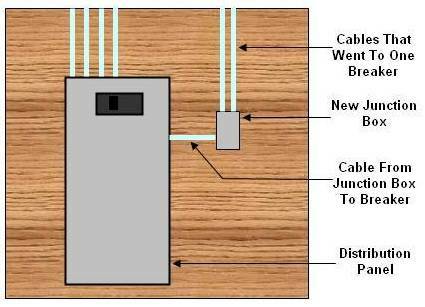 In order to connect two wires to an individual breaker you must make the connection in an electrical junction box, outside of the distribution panel, as shown in Figure 3. Turn OFF the power to the distribution panel. Remove the cover plate from the distribution panel. Remove the wires from the breaker and their corresponding neutral and ground wires. Remove the cables (2 above) from the distribution panel. Install a junction box at an appropriate location next to the distribution panel. Install the two cables that were removed from the distribution panel into the junction box. Run a cable, of the appropriate gauge size for the breaker, from the breaker in the distribution panel to the junction box. You can also run a conduit from the distribution panel to the junction box if this is more convenient and run individual wires or a cable in the conduit. Additional information on PVC conduit. In the junction box connect the blacks to one another, the whites to one another and the grounds to one another. Also connect the ground to the junction box grounding screw. Additional information on proper methods of terminating electrical wires. Install an appropriate cover plate on the junction box. In the distribution panel connect the black wire to the breaker, the white wire to the neutral buss and the ground wire to the ground buss. Replace the distribution panel cover plate. The installation is complete and you can turn the power ON. 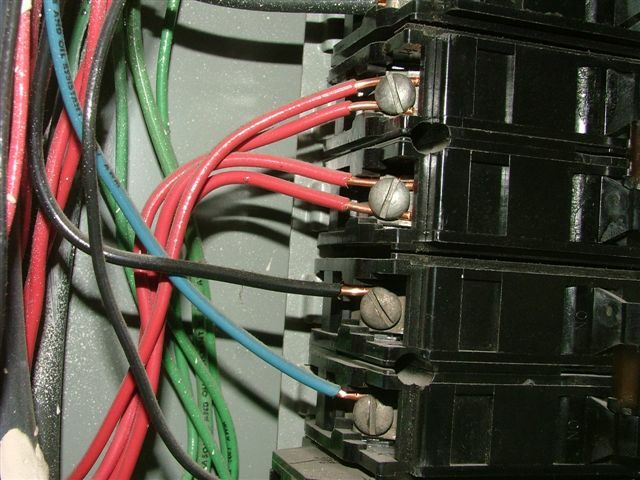 If you are installing a whole house surge suppression the wire leads going to the device are generally connected to two of the breakers (one for each line). A surge suppressor is allowed to share a breaker with a circuit.